Hello there! As usual, I’m beginning my week with ‘The Monday Quiz’, over at Acting Balanced. Who doesn’t love a quiz, first thing on Monday morning, right? At least we should know the correct answers to this quiz, since this quiz is all about us! 1. Happy February! It’s Canned Food Month… who knew? Do you can your own foods? Do you eat canned foods? So far, I’ve learned how to ‘can’ tomatoes, green beans, potatoes, pears, and beef stew in Mason jars, and I enjoy doing it. For now, I usually put the rest of our ‘canned’ vegetables in our freezer. Since we began growing our own garden, again, I’ve been doing some ‘canning’ during the summers. We do have some actual cans of food in the pantry, as well. Pork & beans, tuna, mixed vegetables, and fruit cocktail are a few of the canned foods I buy and use on a regular basis. 2. February 3rd is also the day the music died – Buddy Holly, Richie Valens and the Big Bopper died in a plane crash in 1959. – what other great musicians would you like to honor today? Well, if we’re talking great musicians who have passed away, I’d add Roy Orbison to my list, and, of course, Elvis. I liked Jim Croce, as well. All three men had a unique sound. 3. Do you listen to the radio? Internet radio? Occasionally, I’ll listen to the radio in my car, along with all of the commercials and talking, but when I’m at home, I listen to satellite music via Dish Network because it’s nice not to have to listen to all of the talking! 4. Both Wiarton Willie (Canada) and Puxotawny Phil (US) saw their shadows and predict six more weeks of winter – do you agree? Of course, I agree! Who am I to disagree with Puxotawny Phil? I don’t know how everyone else feels, but spring can’t get here soon enough, this year! Friday morning began as another cold and cloudy day, but by lunchtime, the sun found its way through the clouds and the afternoon warmed up nicely. I spent part of the afternoon at the dentist, getting my teeth cleaned, but, thankfully, I didn’t have any dental problems! Ed came home from work and jumped on his tractor. We thought we were over the cold, gloomy weather for a while. Imagine our surprise, when we woke up to rain on Saturday! For the third weekend in a row, Ed didn’t get to burn the field off. He wasn’t a happy camper! Our Saturday got even more gloomy when we received a call telling us that Micah, the son of Ed’s former co-worker, had lost his battle with lymphoma. A little over a year ago, Angie, had given up her position as a Nuclear Medicine tech, to devote all of her time to her son, after learning that son, Micah, had a rare, and aggressive form of lymphoma. Cancer is always bad, and death is always sad, but it’s always the worst whenever it involves a child. Micah recently celebrated only his seventh birthday. Our hearts go out to Micah’s family. On Sunday, Ed and I decided to venture into the city to see our son, Brad, who was home babysitting Evan while Jennifer pulled a weekend shift at work. It had been two weeks since we’d seen Evan, and boy had he grown and changed a lot during that time! It took Evan a few minutes to warm up to us, but once he did, he cooed and smiled a lot, and of course, I enjoyed every minute of it! I am so proud of Brad. 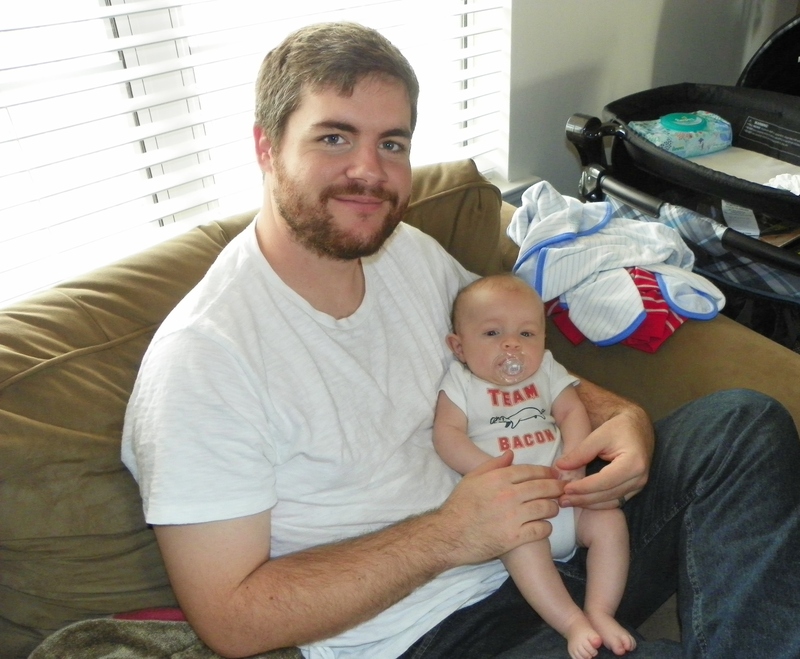 He’s a ‘hands on’ dad, who can bathe, feed, and diaper little Evan like a pro! (Brad reminds me so much of the way Ed was, when our babies were small.) Evan’s a lucky little fellow, to have Brad for his dad. I’ve discovered that one of the best rewards of growing older (besides grandchildren) is getting to watch my three children grow up and become good parents. Ed and I have been triple blessed! Ed and I stopped by Wal-mart, Home Depot, Little Caesar’s, and the Dollar Store, on the way home from Brad’s house. Wal-mart was absolutely CRAZY, and we couldn’t out of there fast enough! Enough said about that. We noticed Home Depot had just gotten in a new shipment of trees, so we decided to stop and check them out. I found an Eastern Red bud tree, so Ed bought it for me, to replace ours, which died late last summer. Ed said the tree could be my early Valentine’s Day gift, and I suppose that’s appropriate since its leaves are heart-shaped! It was a rather large tree, and just barely fit into my car, which made for an interesting ride home! There’s nothing quite like riding home with the top of a tree stuck in between the front bucket seats! The Superbowl game was definitely not an enjoyable one! The commercials were only ‘so-so’ and I think they saved most of the best ones for last. My favorites were Budweiser’s ‘Best Buds’ commercial (the puppy and the Clydesdales), and the Doritos commercial (with the little cowgirl riding the dog). I liked nothing about the game, especially the score. Well, that’s my weekend. So how was yours?